A driver who caused a Derbyshire student's death months after knocking down another pedestrian has failed in a bid to have his sentence reduced. Abdul Fatah Sujac, 22, was locked up for six years and three months at Southwark Crown Court in October after he admitted causing death by dangerous driving. Sujac was at the wheel of a BMW sports car, and travelling at twice the speed limit, when he cannoned into 19-year-old Laura Keyes, in Deptford, south London. Laura, a student of musical theatre at Trinity Laban conservatoire in Greenwich, was out celebrating with pals when she slipped while crossing the road. Had Sujac been driving within the speed limit he would have had time to react, Lord Justice Simon told London’s Appeal Court today. But he was going much too fast, the court heard, and was aggressively under and overtaking other vehicles before the collision. Laura, from Tideswell, was given emergency first aid but declared dead at the scene. Sujac, of Sunrise Close, Stratford, east London, challenged his sentence today, claiming it was too harsh. Lord Justice Simon, sitting with two other judges, noted his remorse and the flashbacks he has suffered since the tragedy. But he also highlighted the devastating impact of Laura’s death on her family. Her father submitted a victim impact statement to the court, which the judge termed a “very moving articulation of his grief”. “We had no time to comfort her or say goodbye,” said her dad. Sujac’s crime was made worse by a previous conviction in July 2017 for knocking down a pedestrian at a crossing, causing serious injuries. 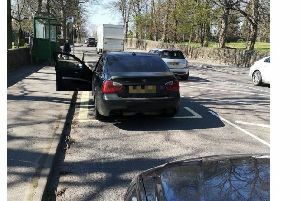 He was fined over that incident and received nine penalty points on his licence. Even after that, Sujac continued to brag about his reckless driving, the Appeal Court heard. Two days after being sentenced, he wrote: "Nine points ain’t going to stop me from driving”. A video clip on his phone from last September showed him driving along a tunnel while crossing over double while lines. Sujac was guilty of “a deliberate piece of appalling and dangerous driving” which cost Laura's life, said Lord Justice Simon. “This was a prolonged, sustained and deliberate course of very bad driving. “Furthermore the judge was entitled to take the view that this was a young man who glorified such driving."